Be the first to share your favorite memory, photo or story of Neoma. This memorial page is dedicated for family, friends and future generations to celebrate the life of their loved one. Age 92 of New Lothrop passed away peacefully on Wednesday, March 20, 2019 at Union Court in Chesaning. A Mass of Christian Burial will be held at 11:00am on Friday, March 22, 2019 at St. Michael Catholic Church of Maple Grove with Father Cotter and Father Johnson officiating. The family will receive friends at Nelson-House Funeral Homes Martin Chapel on Thursday, March 21 from 2:00 to 8:00pm with a Prayer service at 7:00pm. Visitation will also take place at the church on Friday from 10:00am until the Mass. Neoma Jane (Erno) Wendling was born in Flint on April 27, 1926 to Clarence and Clara (Charlebois) Erno. She married James John Wendling on June 12, 1948 and they enjoyed 57 years of marriage prior to his death on August 27, 2005. 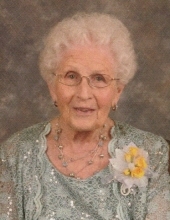 Neoma worked at the OPA during World War II and Citizens Bank. She was a gifted seamstress, baker, and homemaker. She was also involved in the St. Michael's SPRED program for 35 years. Neoma is survived by her 7 children, Carolyn (Dallas) Birchmeier of Chesaning, Janet (Richard) Maxa of Chesaning, Mark (Maudie) Wendling of Fenton, Kevin (Jo Lynn) Wendling of Stanton, Terry (Michele) Wendling of New Lothrop, Yvonne (James) Cesal of Grand Blanc, and Renee (Joseph) Dotson of Chesaning; her 21 grandchildren and 30 great-grandchildren; her sister, Sister Robert Ann Erno, O.P. ; and her sisters-in-law, Dorothy Henige and Rose Schwind. She was predeceased by her husband, Jim; her parents; her brothers, Robert (Lucille) Erno and Rodney (Betty) Erno; her grandchildren, Amy Jo Birchmeier, Nathaniel Dotson, and Jennifer Birchmeier. The family would like to thank the staff at Union Court for loving Mom the same way that we did. Memorial contributions are suggested to Heart to Heart Hospice, Twin Township Ambulance, or St. Michael Catholic Church. To send flowers or a remembrance gift to the family of Neoma Jane Wendling, please visit our Tribute Store. "Email Address" would like to share the life celebration of Neoma Jane Wendling. Click on the "link" to go to share a favorite memory or leave a condolence message for the family.